Visit the Unimog-e-Newsletter, click on photo above! An independent Unimog locator, support and information service not affiliated with Mercedes-Benz. Mercedes-Benz® and UNIMOG® are registered trademarks of Daimler AG, Stuttgart, Germany. Parts and Service in North America, Europe and Australia. Buy and sell on the Unimog Exchange. Subscribe to the UniMail mailing list! Unimog owners send us their Postcards. Unimog Games - try our Sliders. TRY IT! 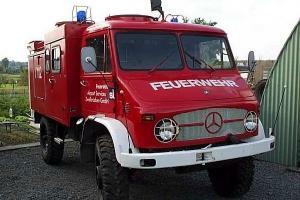 Link to the Unimog Photo Gallery. Introducing the 2003 Unimog for North America. Is this the return of the FunMog? A Texan Goes to Gaggenau Lee Fikes' report. Quadriga, One Man's Quest, Lance Cole's report. The UNIMOG Journal's "Convertible time..." article. Official Mercedes-Benz Unimog pages in English. Official Freightliner Unimog web pages. Official 30th annual Lisbon-Dakar 2008 Web site. Sofcom's 4WD Magazine Australian Army Unimog. Official Daimler-Chrysler AG Web page. New Mercedes-Benz Blue-Tec Diesel vehicles. Official Mercedes-Benz USA Web page. 100 Years of Mercedes, The Story of Passion. US Mercedes Mailing List page. Trademarks and Copyrights, Carradine Int'l ©1990-2018. Add Unimog.Net™ to Your Browser. Link to the Land Rover Network. Unimog - Unschlagbar im Gelände, vielseitig und wirtschaftlich im Arbeitseinsatz. Unimog - Invincible on terrain, versatile and economic in the workplace. UNIMOG NETWORK INT'L ©1990-2018, All Rights Reserved.